The smock mill stood on the site earlier occupied by the Black_Mill. It was marked on the 1794 and 1824 maps. The four storey mill had 14 and 18 inch brickwork. In 1834, the patent sails and a fantail powered a single set of French burr stones, a small pair of Peak stones with a flour mill and jumper. By 1837, the mill was using two pairs of French burr stones. Petition of Robert Steggall, late of Norwich, Co. of Norfolk, now of Ipswich, Suffolk, Miller, an insolvent debtor. To be heard 12 June and the Court of Bankruptcy, Basinghall Street, London. Brick & Wood Tower SAWING MILL. A Recently erected SAWING MILL with sails and all her machinery new and complete, fit to go to work, she winds herself and may be converted into a flour mill at an inconsiderable expense. The Mill stands on a piece of Land containing 20 rods on the top of the hill near the Gas Works. Apply at the office of Mr. S. C. Burton, Solr. St. Giles Street or to Messrs. Spelman, Norwich. With sails and all her machinery new and complete, fit to go to work; she winds herself and may be converted into a Flour Mill at an inconsiderable expense. 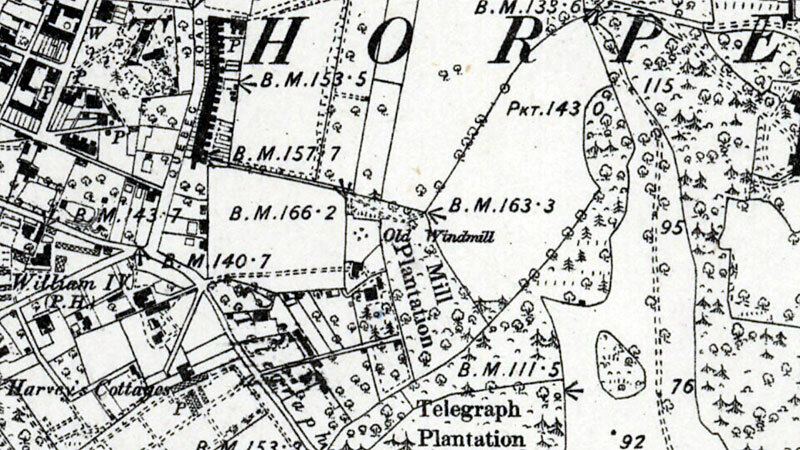 The Mill is situated in a piece of Land containing 20 rods on the top of the Hill near the Gas Works, Thorpe..
For further particulars apply at the office of Mr. S. C. Burton, Solicitor, St. Giles Street or to Messrs. Spelman at Norwich. Hand written note: Reserved at £80. A New WOOD TOWER MILL at Mousehold, Norwich, to be removed. Well adapted for a Marsh of Flour Mill. Will work 2 pairs of 4 ft. stones. Apply to Mr. W. Shibley, 5 York Place, or Mr. Fulcher, Millwright, near the Gas Works, Mousehold.